Проект EU4PAR шукає досвідченого та кваліфікованого спеціаліста з роботи з соціальними мережами, який надаватиме підтримку Уряду України у забезпеченні комунікації реформи державного управління. Дедлайн – 18 лютого 2019 року. The Social Media Marketing Expert will provide support in developing PAR communications including developing digital content, SMM posting, online advertising and other related activities. 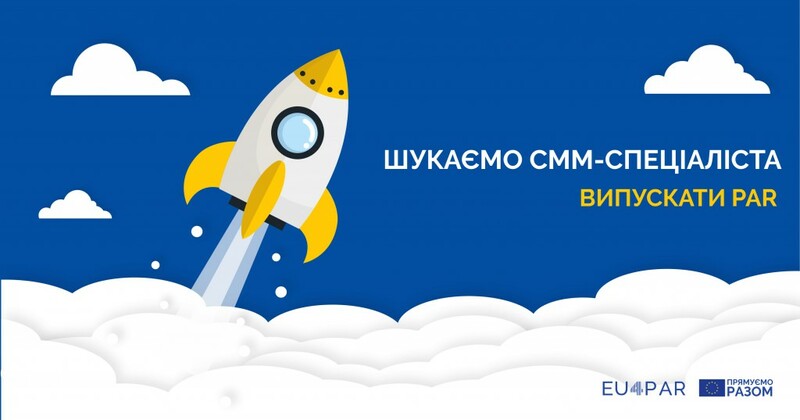 Develop content related public administration reform for Facebook and other digital platforms in Ukrainian and translation into English if necessary. Plan and ensure posting of PAR-related pages in Facebook (Public Administration Reform page and others) in accordance with PAR communication plans and in coordination with PAR communication coordination team and EU4PAR Account Manager. Run advertising in Facebook and other digital platforms, including YouTube. Approval of budget for advertising with EU4PAR Project Manager and Account Manager. Prepare monthly and activity-requested reports on the results of communication through social media and digital advertising (key metrics, audience insights, etc.). Provide support to the government speakers in drafting speeches, presentations, press articles and other documents. Assure proper attribution of donors’ support and donor visibility in PAR communications. Communications with mass media, press offices of the state authorities, industry and public institutions, and civil society organizations in the sphere of key reforms. Any other responsibilities/functions deemed necessary by the supervisor/or senior manager in order to meet the level of the services in the Project. Graduate university degree, preferably in communication, international relations, humanities, political or social sciences. Minimum 5 years of professional experience in related fields. Experience in using modern communication tools, social media, apps, editing photo and video materials will be strong asset. Experience of having successfully developed, managed and implemented SMM campaigns. PC literacy (i.e. Word, Excel, PowerPoint, social media, photo editing and others). Use of web-analytics instruments (Google Adwords, Google Analytics etc.). Fluency in oral and written Ukrainian and English. Knowledge in Public Administration Reform and OECD/SIGMA Principles of public administrationwill be a strong asset. Motivated to contribute towards peace and development and to serve others.